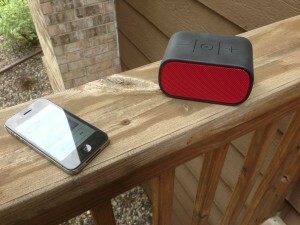 The mobile Bluetooth boombox product category is really popular as of late. I totally understand why. How awesome is it to be able to bring a small, portable device with you and get some great sound out of it to listen to some of your favorite tunes. No doubt the Jawbone Jambox is the king of this product category, but it is a bit pricy, and there is a ton of competition out there. Let take a look at what Logitech has to offer. The first thing you’ll notice the “UE” branding all over this boombox. That’s because this is an Ultimate Ears product. Ultimate Ears is a company that really focuses on pro audio and creating the best sound in their speakers that they can. They were recently purchased by Logitech to bring high quality products like this to more consumers. It was really a great business decision for Logitech. Creating consumer products that have great sound is in this case extremely important. With any mobile Bluetooth speaker the most important question is, how does it sound? The good news is the UE Mobile Boombox sounds really good. However, its good and not great. There are sometimes that I wish it just had a little more bass to it. When listening to audio podcasts it makes the voices sound rich and full, and I was extremely pleased with the speaker. When switching to music, at low volumes the sound was also very pleasing. When I turned it up and brought it outside with me, it found that the bass was a little lacking. Although, I felt I could let this slide because it didn’t try to overpower the bass at high volumes which can end up creating a muffled sound like so many small cheap speakers do. The second thing you’ll notice about this boombox is how small this thing is. It’s about half the size of the Jambox it is going up against, and it feels like a perfect fit in your hand. It makes it extremely easy to move around and place it wherever you might want to. I found myself bringing it into the kitchen, then bringing it out to the patio without missing a second of my favorite podcasts. I really found the size of this to be one of its best features. The real killer feature here though is the battery life. Logitech claims it gets 10 hours of battery. In my completely unscientific study, I got more way more than 10 hours. I managed to go a whole weekend of on and off use without needing to charge it. It was great to not have to think about how much battery may or may not be left in the boombox. It really felt like I just couldn’t kill the battery on this thing. Speaking of charging, when you do need to plug it in it conveniently charges through a micro-USB port. Something most Android owners will already have with their phones, however most iPhone owners will have to bring another cable along. It also has a 3.5inch headphone jack in the back of the device just in case you don’t own a Bluetooth device. Pairing with the boombox is just as easy as any other Bluetooth device. This does allow up to two devices to be connected at the same time, but only one will play music at a time. Having two phones connected can be nice because this can also become a speaker phone when someone is getting a phone call. That way you can answer you phone calls while the music is paused. I only made one phone call through the device and it worked as expected, but nothing special about it. There are three buttons on the top of the device: volume up, down, and a Bluetooth pairing button. Each button does what you would expect. The final nail in Jawbone coffin is the price. $99.99 for the Logtiech vs. the Jambox at $199.99 Now I found them for $99.95 and $135.99 currently on Amazon. Still a 30 dollar savings for what I think is a better product, clearly is a great deal. 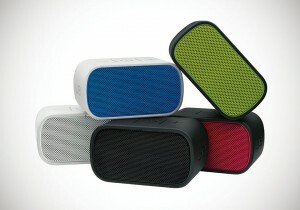 If you are looking to get one of these mobile Bluetooth speakers this is the one to purchase, without a doubt.